Yet for two twenty-something Spanish sisters, it has become the perfect place for their farming and bread-baking business. Ana Marcen, the elder of the two, says she had no previous experience in agriculture. "I studied Greek and Latin and used to work in an orchestra as a singer." Her younger sister Laura used to work as a waitress and studied engineering. Their business idea grew out of something their uncle told them - that in times gone by, the bread in this part of Spain tasted different. It was a flavour he missed. 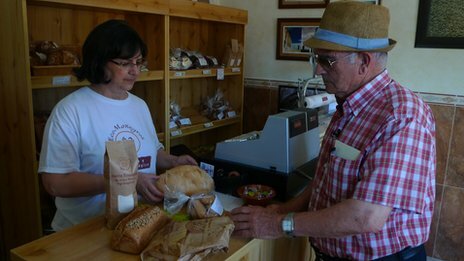 'For the seed we grow, the climate is perfect', two sisters explain why they started a bakery and are growing wheat in a Spanish desert. The sisters say their uncle was "a very curious person, he used to ask himself why bread didn´t taste any longer as it used to." 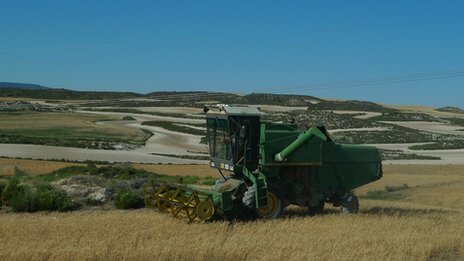 They discovered that a type of wheat seed, known as Aragon 03, had been the secret behind the region's distinctly-flavoured bread. They found an elderly couple who still had a small quantity of the Aragon 03 seed. The Marcens bought two bags of the seeds - and from that their business has grown. The concept of their business is to control the entire bread-making process. They grow the wheat, mill the flour and bake the bread, muffins and other bakery snacks. "Unlike other traditional bakeries that just sell organic products, we control the whole process", says Laura. They set up their business in 2007, just before Spain's economic and financial crisis hit. They were able to get a bank loan of €250,000, ($335,000; £200,000) which they think would be harder to come by in today's post-recession climate. In the first year, their business lost lots of money, but by the third year they broke even. Now, seven years after they first started farming and baking, they own two bakeries and sell their products in eight others. Whatever profit they make, they reinvest in their business as they want to expand and sell online. "Many people told us we were crazy for trying to run a business like ours in a (dry) place like this. But we found out that the seed we grow is perfect for this climate", says Laura. "People think that there is no life in Los Monegros, but in reality the region is rich in plants and wildlife. "As my uncle used to say, you have to bend your knees and look closely. For example, I see opportunities where others don't." From the very start, this was a family-run business. Their father Daniel harvests the crop, their mother Mercedes, works in one of their shops, and their younger brother, Jesus, mills the flour and bakes the bread.